This is a wonderful method, I’m going to have to give it a try with my four little ones! Thanks for the free printable as well! This might help us! My kids definitely struggle with figuring out where to start and then getting overwhelmed by too much. Saving this for sure! Using a checklist really does help them stay on track, and they feel so proud of themselves when they’re done! Great idea! 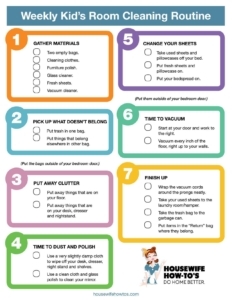 Cleaning a room can be overwhelming, and this checklist would be a great help. Thanks for linking up and sharing at Celebrate It! I’m glad you like it, Susan! This is a good thing. Kids should really be train to do some cleaning. If they do this tips and make it a habit they will eventually bring that until they grow old. Thanks for posting. I agree. Kids tend to be the main source of mess, and it’s good for them to learn how to clean after themselves rather than take for granted that it’s Mom’s job to do it. Thank you so much! My children’s idea of cleaning their rooms involves pulling OUT the Lego’s. Talk about AAAACK factor. I needed something to help. 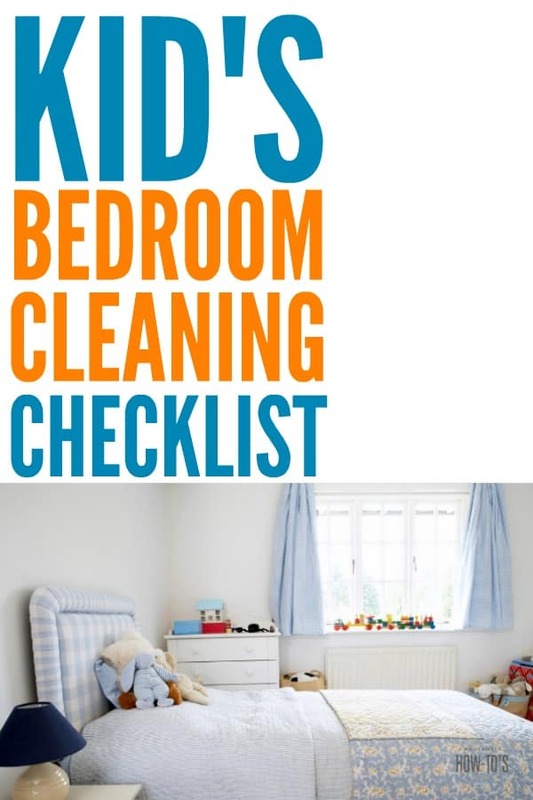 We have a similar checklist for the kids rooms. Thanks for sharing at Fluster’s Creative Muster. Looking forward to seeing what you link up next week. Checklists really are great for kids, aren’t they? Hmm… I’ve never tried this. As a kid I remember being told “go clean your room” and then being unsure what my mom expected. I’ve been using the same approach with my boys and not been happy with the results. I think your approach might be worth considering. Thanks. You’re welcome! I had to come up with *something* since my son’s version of cleaning his room and my version are so drastically different. Hint: his involves shoving everything under the bed. Aaaack! Another tip I read somewhere (I wish I could remember where, because the guy should be given full credit!) anyhow, for kids who become easily overwhelmed when presented with a room that is in disarray and needs to be cleaned… Most of the time, it’s the overwhelming “stuff” that puts kids (and adults) into full on “I can’t do this” mode. Once the stuff is put away, the rest of the cleaning is easier. Take a basket and put it in the middle of the floor. This is the “inbox” go around the room and put everything that needs to be picked up into the basket (no matter what it is – no decision is made at this point – everything goes into the basket). If the basket gets full, put the overflow around the outside of the basket. Once everything has been picked up, then and only then you start to put away. Remember everything should be in this pile! Next: This is very important: Take one thing at a time (only one!) and put it away in its place, put it in the trash, or put it in a box to be taken to another room. This requires less by way of decision making so it’s not such a huge mountain to climb for them. It’s much easier to decide what to do with only one thing than it is to look at a room and say “OMG I have to put ALL this away… I can’t do it! My mother did something very similar when I was little. Basically, she’d wait until I was at school then dump every drawer in the middle of my room. On top of this, she’d throw everything that was on the floor of my closet or on top of my desk, dresser or nightstand. Then she’d tell me to put things away properly, one at a time. You can imagine my attitude toward cleaning when I was a kid as a result, LOL! I actually did this when I was a kid, when I rearranged my room, everything went on the bed. Then I put stuff away where I wanted it to go. That’s still one of my favorite ways to completely declutter and organize a room. If I can’t think of a place for something, I probably don’t need it so out it goes!